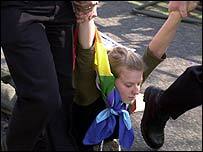 School children across the UK have walked out of lessons to protest against war on Iraq. Police were called in when young demonstrators among a crowd of 5,000 in Birmingham started throwing stones and attempted to enter the main council building. In Manchester, where 3,000 pupils left school, some blocked a main route through the city centre as 12 people - believed to be adults - were arrested. There were also demonstrations by 1,000 school children in Sheffield, 300 in Swansea and hundreds more in Westminster, which largely passed off peacefully. 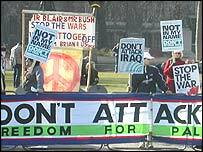 The Stop the War Coalition co-ordinated action around the country, on the latest of several days of protest against the impending conflict with Iraq. Ilkley Grammar in West Yorkshire had to close for the day after 500 pupils walked out. In Leicester, police set up extra patrols outside schools to prevent a similar occurrence. But dozens of pupils managed to gather in the city centre to listen to anti-war speeches and chant: "No war for oil." They had been told missing classes would be treated like any other form of truancy. However, Fiona Bagworth, 14, who walked out of Beecham College in Oadby, Leicestershire, said: "When you believe in something so strongly, you just have to do it. "We have been warned about suspension and being put on report but it doesn't matter." James Robinson, 18, who had left Leicester Grammar School for the rally, said he did not believe he would get in trouble. He added: "It is a beautiful day and I want to enjoy it but I don't feel that I can just sit back in the sun when bombs are going to be dropped in another country. "The government is using money that should be used to educate people here." Elsewhere, around 400 pupils from Kingsmead Community School staged a one-hour demonstration in Wiveliscombe, Somerset, in defiance of orders from staff. John Bangs, head of education at the National Union of Teachers, said pupils missing lessons to attend protests should not be treated as seriously as persistent truants. He told BBC Radio 4's Today programme: "It is of a different order and the reprimand should be of a different order as well. We don't condone any form of truancy, but there is a difference in magnitude and these are major events." But Bob Carstairs, assistant general secretary of the Secondary Heads Association, said: "Our advice is not to allow this but to treat it as normal truancy and take appropriate action. "If pupils wish to demonstrate, they are perfectly free to do so outside of school hours." Meanwhile, 20 pupils have been suspended from a secondary school in St Just, Cornwall, after they refused to take part in lessons on Tuesday and led a march to nearby Penzance.